We have just released updated industry statistics as at the end of 2011 on our main NGV statistics data page. 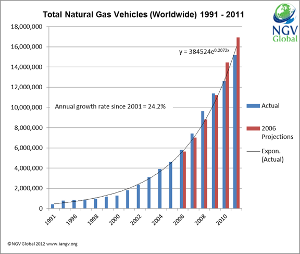 The stats indicate there are more than 15 million natural gas vehicles running around the world. Though currently lagging behind projections made in 2006, higher than expected sales in 2011 (2.576 million actual vs 2.495 million projected) resulted in a slight closing of the gap. The increase was more than twice the increase of 2010 (1.249 million), indicating a strong recovery from the slump caused by global financial conditions. Data is collected from a variety of industry sources and should be taken as approximate only. Figures indicate that Iran now has the highest number of natural gas vehicles, with 2.859 million on the road, slightly ahead of Pakistan at 2.85 million. Data currently excludes marine vessels and off-road vehicles at this stage but these will be added in future years. Updates and corrections are welcome via email.